That answer should always be, YES! 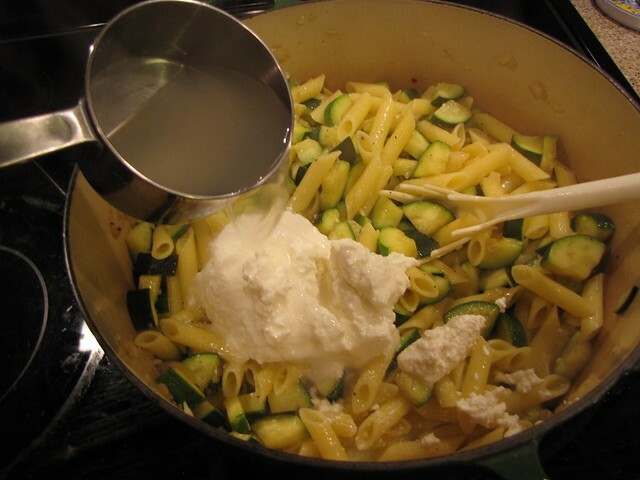 Quickly sautéed zucchini meets creamy ricotta cheese in a dinner that cooks in just about the time it takes you to boil the pasta. 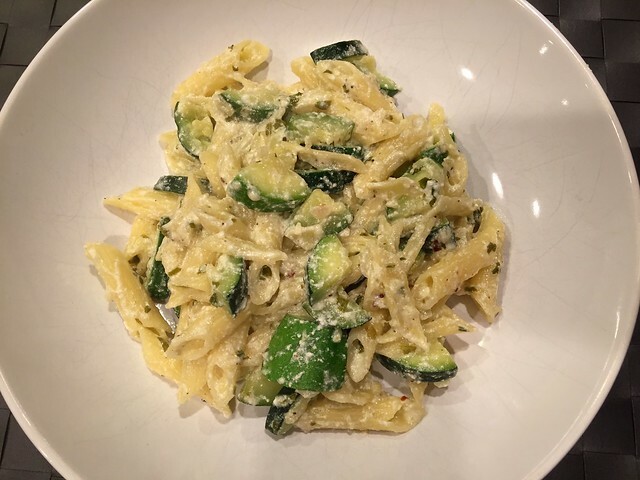 Zucchini, Onion, Garlic, Lemon, Fresh Basil, Pasta (GF or Regular), Ricotta Cheese, Olive Oil, Pecorino Romano Cheese, Red Pepper Flakes, Salt & Pepper. 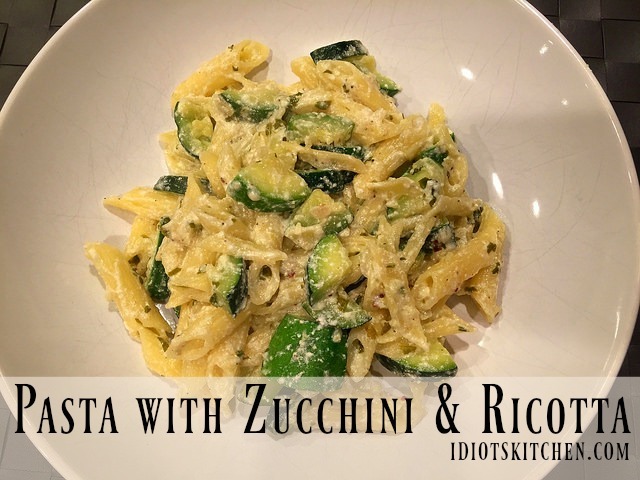 I really like to load up this pasta with zucchini. 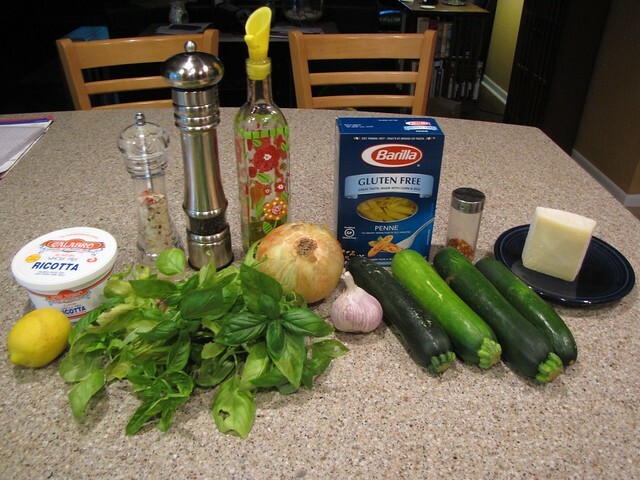 I have 4 medium zucchini…a little over 2 pounds for ¾ pound of pasta. 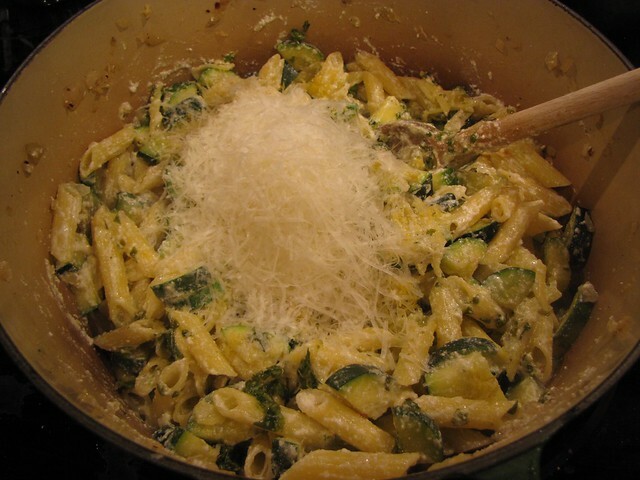 If you are using a full pound of pasta, add at least one more zucchini. If you wind up with one of those giant zucchinis, you could probably use it for this dish, however I would definitely cut it open and scoop out the seeds with a spoon or melon baller. Zucchini seeds, unless they are really small and tender, will separate from the flesh of the zucchini and float around weirdly in your dish. Put a big pot of water on the stove to cook the pasta. It can start heating up while you do some chopping. 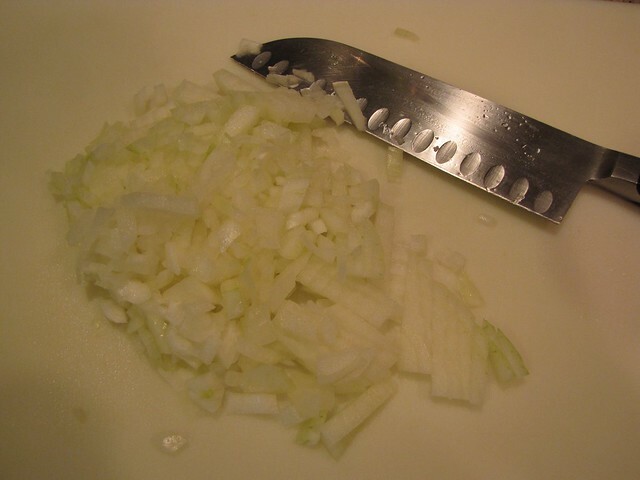 Finely chop 1 medium onion – about 1-1½ cups. 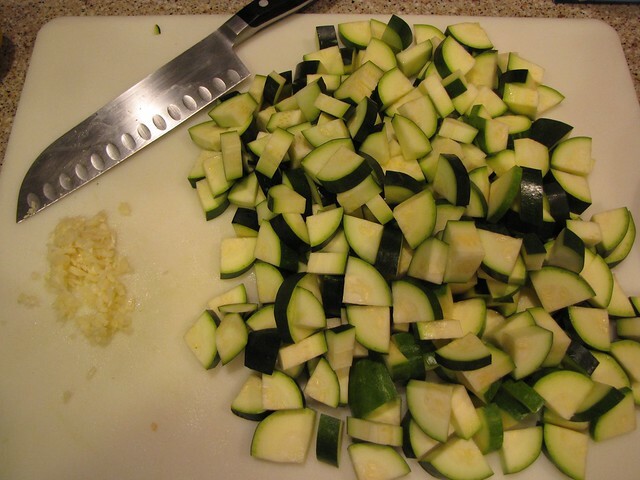 Cut the ends of the zucchinis, cut them into quarters lengthwise, and then into small wedges about ½ inch thick. Finely chop 2-3 cloves of garlic. 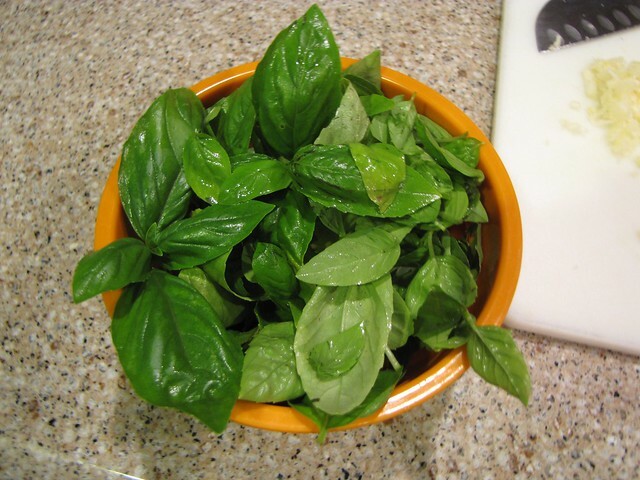 I have about 1½ cups of fresh basil leaves. The original recipe calls for 2 cups but this was the last basil in my garden at the time and not looking too exciting. Fortunately with summer and zucchini in full swing, it’s easy to find big bunches of fresh basil in stores and farmer’s markets. 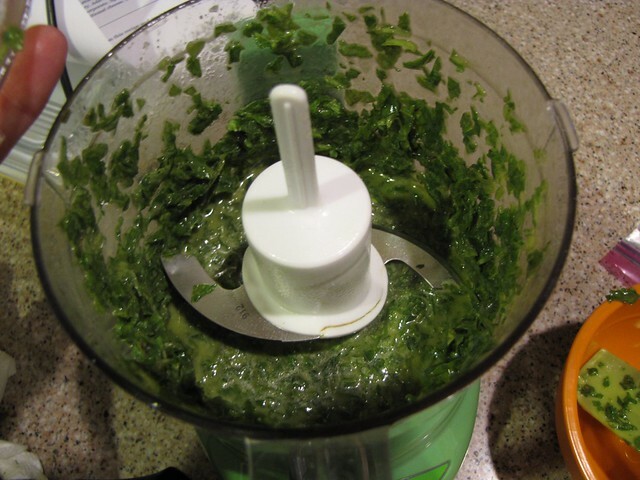 The original recipe calls for making a quick pesto (although,for some odd reason they don’t call it that) by grinding up the basil leaves with 3 Tablespoons of olive oil. 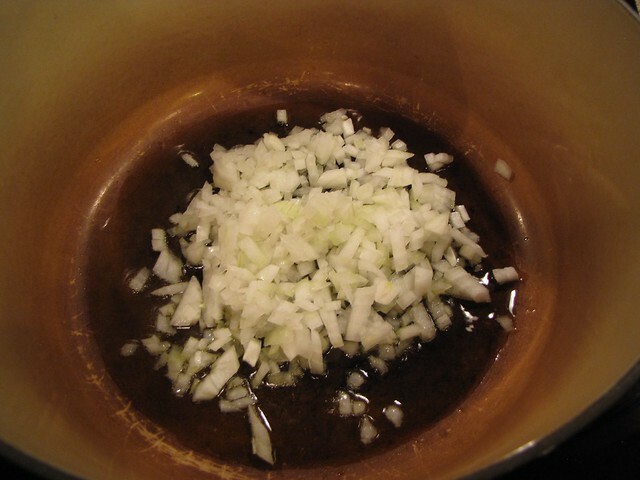 I used less oil, about 1½ Tablespoons. Oddly, my basil didn’t grind up very well (I think it was still too wet) so I had more of a chopped basil situation than a paste. This gave me the idea to just chop the basil with a knife and skip this whole step. Much easier, quicker, and one less gadget to wash. So, you can take your choice…I’m committed to chopping from now on but you can certainly use the food processor. Also, if you don’t have or can’t find fresh basil but do have access to pesto, you could substitute a heaping spoonful of prepared pesto for the basil. 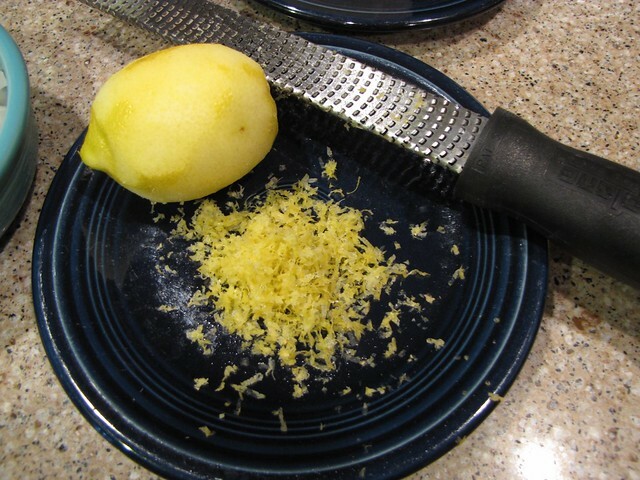 Use a microplane or other small grater to remove the zest from 1 lemon. Set the zest and the basil aside. If you haven’t already done so, now is the time to cook the pasta. Season the water with couple big pinches of salt and drop in ¾ pound of short, tubular pasta like ziti, penne, or spirals. Grab a large pot or pan that is big enough to hold all of the vegetables and eventually also the pasta. Heat 2 Tablespoons of olive oil in the pot over medium high heat. Add the onions and sauté until tender but not browned, about 5 minutes. Add the chopped zucchini and garlic and turn the heat up just a bit. You want to cook the zucchini quickly over pretty hot temps so that it doesn’t get all soggy. 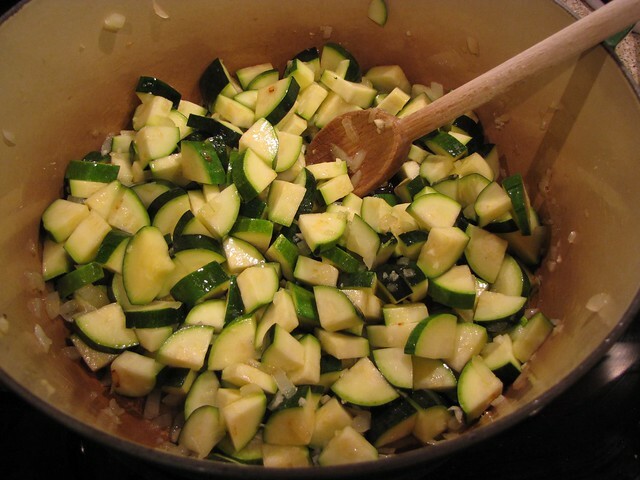 Stir the zucchini a few times while it cooks so that all of the pieces are covered in the oil from the onions. 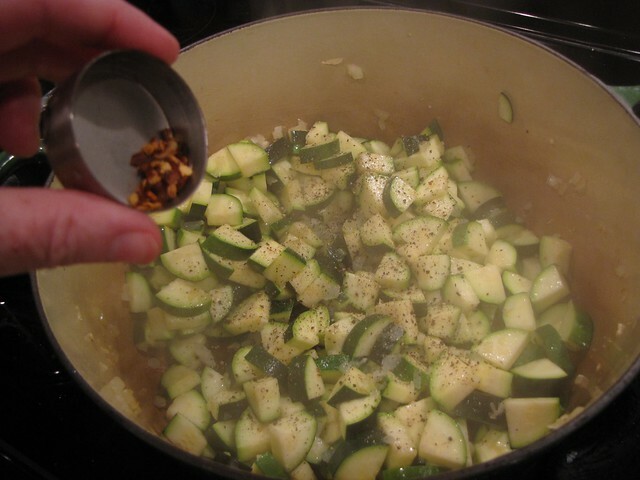 Season the zucchini with a pinch of red pepper flakes and salt & pepper to taste. You only need to cook the zucchini about 5 minutes. Rescue it and turn off the heat when it is just starting to get tender. Residual heat from the pan will continue to cook it as you add the other ingredients. 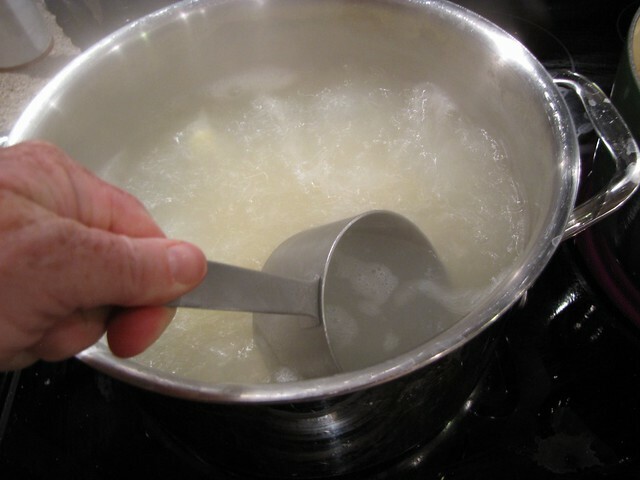 When your pasta is al dente or tender to the bite (about 8-10 minutes) scoop out 1 cup of the starchy pasta cooking liquid and set aside. 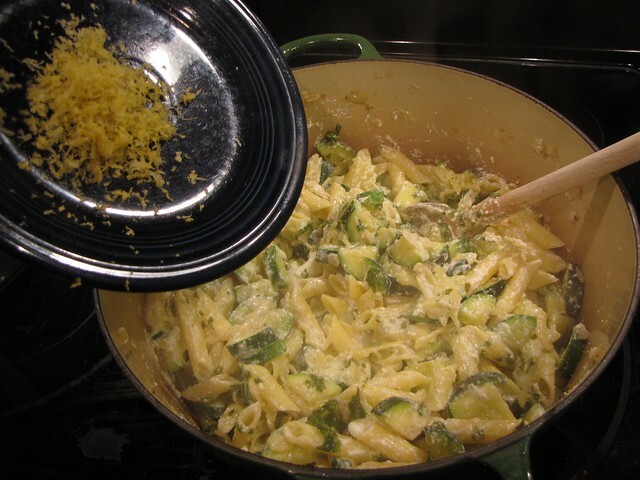 Drain the pasta and then add it to the big pot of zucchini. Add 8 ounces of good ricotta cheese, the chopped basil or pesto, and the lemon zest. Start stirring the ricotta into the pasta adding the pasta water a little at a time as you go so that it makes a creamy sauce. I also added the juice of half of my lemon for a little bit of extra tang. I ended up using about ¾ of the reserved cup of pasta water. If you feel like your pan has cooled off too much, turn the heat back on to low so that the pasta stays warm and the cheese will melt. Try not to get the pan too hot after adding the basil or it will turn dark. Speaking of cheese, a nice cup of grated Pecorino Romano goes in as well. Give everything a good stir and taste and then adjust the seasonings of salt, pepper, red pepper flakes, and lemon. Serve in bowls garnished with a little extra cheese and basil if you have it. Any time you add ricotta to a dish, it gives it that good creamy quality like the inside of a lasagna. You can certainly start with these ingredients and add even more veggies if you’d like. I think a couple of big handfuls of chopped fresh spinach would be a great addition. Mushrooms would be good too. And you know how much I like to add peas to things. This is light and fresh and cooks quickly making it perfect for weeknights or busy summer schedules. Me either! I think it’s wrong every time I have to go pay for it at the store.